Nightfall has one of the cheesiest settings I've ever seen in a professionally published game. Not only that, but the setting has almost nothing at all to do with the actual game you're playing. And yet I have absolutely no problem at all overlooking the thematic flaws, because Nightfall has grown on me like a fungus, and is now barely edging out Puzzle Strike to be my number-one go-to deckbuilding game. And if there's one thing that games like this need to really shine, it's more cards. More cards mean more variety, more strategies to uncover, more combinations to try. So every time Nightfall comes out with an expansion, I get all excited (of course, since Blood Country is only the second Nightfall expansion, it's not like there's a longstanding precedent). And every time I am delighted. Blood Country takes the three-way monster mash of Nightfall and moves it into the country. New vampires have mullets, new hunters sport trucker caps, and new werewolves ride motorcycles. There's even a card called Wight Trash. I am not making that up. But honestly, the theme for Nightfall is completely discardable. It could be flying monkeys and cowardly lions, for all I care. With Nightfall, the game is what counts. Attacking your friends, chaining your actions, building your combinations - that's what makes Nightfall so awesome. And so for Blood Country to be a success, it has to make the game better. I could care less if there are hillbilly bloodsuckers, as long as they give me more ways to have fun. And so I am pleased to state unequivocally that Blood Country is awesome. In fact, I think it's potentially better than Martial Law, if only by a little. It does introduce a big random factor, but at the same time, it also gives you a lot more ways to exploit kickers and create wild combos, even building off your opponents' plays to improve your own. For a more concrete example, consider the new card Shotgun Party. The chain effect lets you get more minions in play, but that's not the best part. The best part is that the next card gets its kicker - twice. This is really cool if the next card lets you throw some pain around. It's less awesome if it says you have to kill some werewolves, and you're the only guy with werewolves. Then you get to feel stupid. Trust me - you will feel stupid. I can vouch for that. I also like Shut Up and Soldier. This one lets you choose an effect in play - anywhere in play - and make it happen, with you choosing all the targets. This has the potential for madcap hijinks if played at the right time. You could use somebody's monster-damaging effect against their own guys, or damage an opponent with his own cards. That's pretty fun, and really opens up the possibilities for creating wild combinations and Machiavellian card plays. Another neat new element in Blood Country is the specific wound effect. That sounds like a medical school term, but all it means is that a lot of cards are keyed to the type of wound you can get. Up to this point, the only reason you cared what kind of wounds you were getting was if there was a tie, and in the 50 or so games I've played of Nightfall, that has never happened once. But now a Bleed wound might reduce the damage you take from an attack, or a Burn wound might let you strike again. It's capricious, of course - you might buy a Vampiric Turning, hoping to use Bite wounds to grab up enemy minions, and then spend the whole game earning Burns and Bleeds, so that you never do get to use that cool stealing ability. Lots of the cards in Blood Country are more powerful than what we've seen before, but they tend to come with downsides. For instance, that Wight Trash I mentioned earlier hits like a freight train, but gets discarded before he can attack, unless you time it just right. The Infected Ghoul is a really great defender and a dangerous attacker, but unless you get the kicker, he dies as soon as he hits the table. There are some really impressive cards in Blood Country, but to exploit their power, you have to be fairly good at this game. 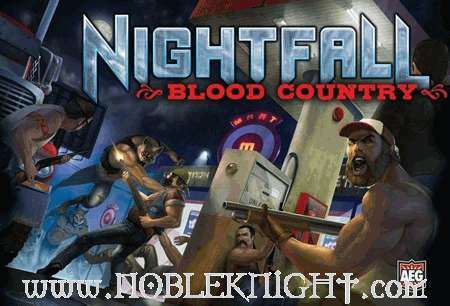 If you're new to Nightfall, or just haven't played at all, you don't really have any reason to pick up Blood Country. But if you're as big a fan as I am, and you play it anywhere near as often as I do, you should be ordering Blood Country the next time you can afford it. Just keep in mind that Blood Country only comes with new order cards - no starters or wounds - so you'll still need either the original Nightfall or Martial Law if you want to play Blood Country. But then, if you're in the market for Blood Country, you probably have everything, anyway. This isn't an expansion you would bother buying unless you already know you love the game. But if you do like Nightfall, you should get Blood Country, pronto. If you like Nightfall as much as I do, you should get Blood Country. And you should get it from Noble Knight Games, so you can save money and so they keep thinking I'm good for business.